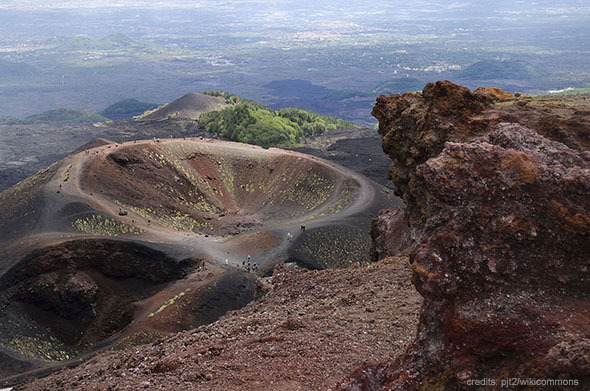 Discover Mount Etna, the highest active volcano in Europe, with our weekly trekking tour. This is a small-group hiking tour to discover Etna's nature park, ancient craters and lava caves. Transfer from Syracuse included. The group tour takes place every week from July to September. During the rest of the year it's possible to contact us and book a private tour. Overview: This full-day tour is the best option to discover Europe's highest active volcano. This is not the typical large group excursion with explanation in 3-4 languages on board. This is a small group tour with max 15 participants (but often only 7-8 guests). Our guide will give you information on board but will also lead a hiking once you arrive on the volcano. You will discover one of the many hiking routes on Mt. Etna. A walk of about 3 hours to visit ancient exctinct craters, the lava sand and the woods on the mountain. The guide chooses the best route for the group. The height of the hiking is at 1700-2000 m. Our guide will also inform you, in English and Italian language about the geology and nature of the Etna. After the trekking you will have a break for free lunch and then you will visit an ancient lava cave. The total duration, including the transfer from/to Syracuse is about 7-8 hours. For further information and booking contact us by mail or phone or use the online booking. 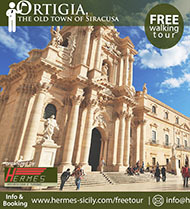 In this section you can choose between a lot of guided tours in the area of Syracuse and Ragusa: discover the Sicilian art and baroque, visit the most famous archaeological monuments or take a thematic tour like the "Commissario Montalbano Tour" It doesn't matter if you are a group or you are alone... you will certainly find what you are searching for. We also organize special tours and projects for schools to discover sicily's past. This is our printing section about Sicily and archaeology. Discover the beauties of Sicily watching the online photogalleries, buy the royalty free photos. 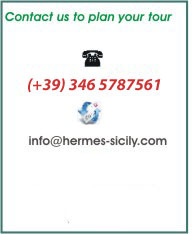 Read the reviews about books on history, art and archaeology in Sicily or buy them online. Here you can also find the books published by Hermes' authors. Read our online handbook for self-made tourists. Here you can find hundreds of tips and useful informations: lists of hotels, Bed and breakfasts and other accomodations, transports, monuments. Program your visit reading our reviews about places, food and Sicilian tradition.